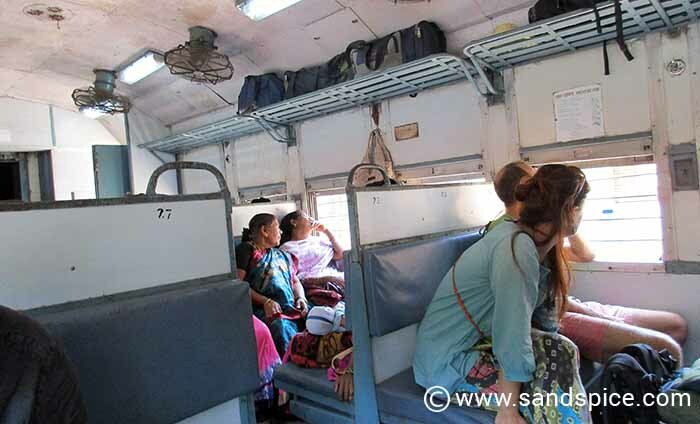 As relieved as we were to be leaving Kochi, we were a little apprehensive about our forthcoming train journeys to South Goa via AC2 train class. 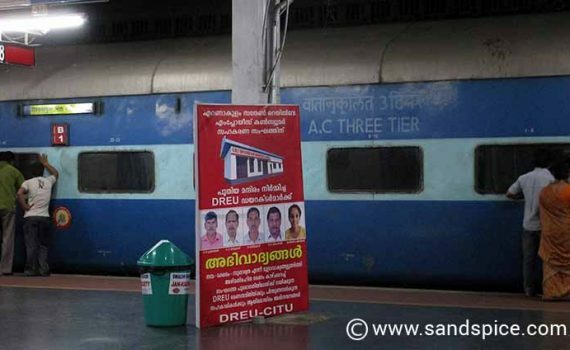 We had pre-booked berths on an AC2 train leaving that evening from Kochi at 10pm. We should arrive early the following morning in Madgaon, Goa. From there, we would have to find our way to Canacona – the closest town to the South Goan beaches. 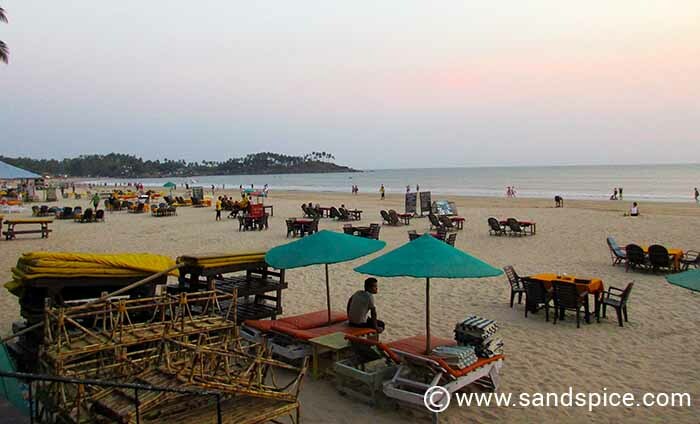 If all went to plan, we should have plenty of time to find accommodation, and hopefully settle in for a pleasant evening on one of the famous Goan beaches. There are two main train stations in Kochi. To avoid confusion, we made sure to instruct our rickshaw driver to take us to the Ernaculum Junction station (we had arrived at the Ernaculum Town station the day before). This time there were no delays or cancellations: the train arrived a little after 10pm. We had our coach and seat numbers, and were quickly able to find our berths. Oddly, one of our berths was inside the 4-berth compartment, and the other was in a 2-berth bay on the other side of the aisle! (in each section, there are 6 berths in all). Two Indian guys were also booked into our bay, and fortunately for us they spoke English. Between us we changed seats, and we arranged to sleep on the lower 2 berths of the 4-berth compartment. 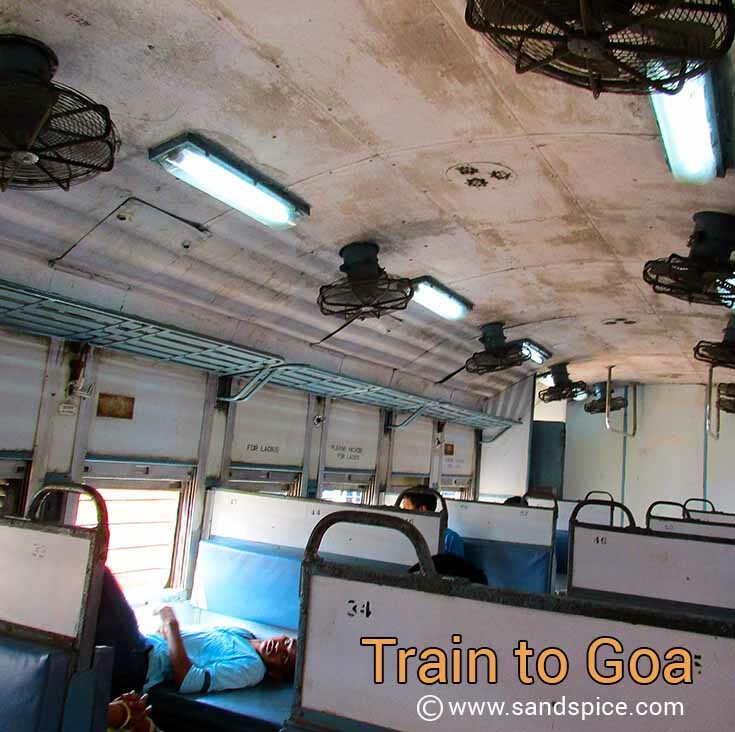 Luckily, the extra berths in our bay remained unbooked, at least until after Goa (the train would carry on well into central India). The berths were padded, and comfortable enough. After our tickets were checked, we were given pillows, sheets and blankets. We then made our beds, drew the curtains, and settled in for the night. There were basic toilets and washing facilities at the end of the coach. Our 2 travelling companions left very early the next morning, a couple of hours before our stop. There was enough noise and clattering in the aisles to flatten any ideas of a leisurly lie-in. At one point a steward literally threw 2 trays onto our beds, followed by a flask of hot water. 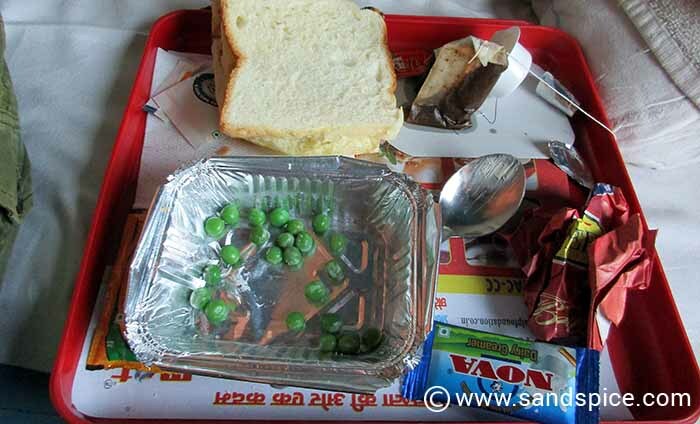 This was the complimentatry breakfast, consisting of rice with frozen peas (microwaved, they were hard as bullets), a piece of stale bread, wafer biscuits and a tea-bag. Shortly after this our pillows and sheets were brusquely removed (and – I hope – sent to the wash). The only direct interaction we had with our young stewards was when they came back into our cabin requesting “Baksheesh” for their sterling service. I gave them 20 rupees, only to be confronted 5 minutes later by another couple of stewards with beaming grins on their faces, and with the same request. Obviously, word had gotten round there were a couple of foreigners in coach 7 primed for fleecing. Since we had been pretty much ignored since we boarded the train, I now returned the favour. When we got off the train in Margao, it was around 8 am. From Madgaon, we needed to catch another train to take us the 35 kms to Canacona. I purchased tickets at the ticket office (30 rupees one-way for 2 tickets, Sleeper class). We were given a variety of departure times, depending on who we tried to speak to. After a couple of hours of waiting around, no trains appeared to be going in our direction. There were no signs anywhere, and nobody could speak enough English to understand us. We had a stroke of luck when a young Indian guy overhead us trying to get through to the Station Master. He casually said “Follow me”, crossed the platforms and walked a good distance along an adjacent platform to where a battered old train had been already standing for several hours. We boarded the train and thanked the guy. Several other equally confused foreigners had watched us go, and followed us onto the train. 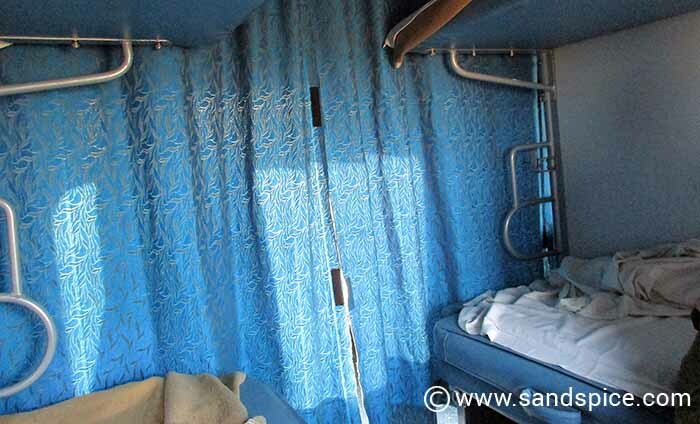 At least this Sleeper train was relatively empty, so our journey was quite pleasant. It only took an hour or so to reach our destination at Canacona. 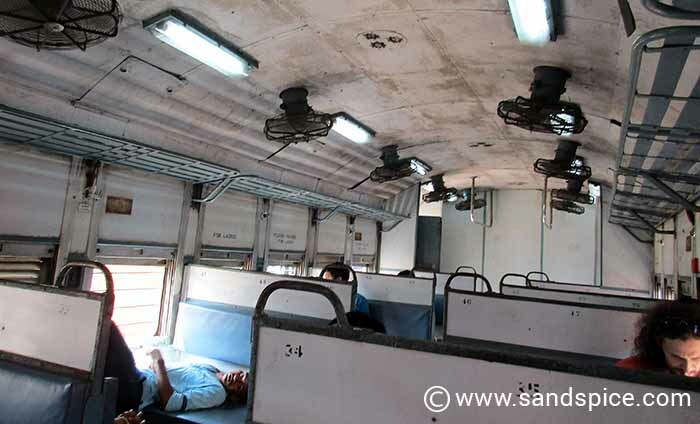 The Sleeper coach itself was pretty grubby, and nobody came to check our tickets. Our arrival at Canacona was quite novel. The train stopped parallel to the station platform, but not next to it. We had to climb down onto the tracks, then cross over another set of tracks before reaching the platform, 4 feet above us. Five other travellers got off the train with us, and we helped each other throw rucksacks up onto the platform, and then precariously climb up onto it ourselves. Definately not a journey for the old or disabled. 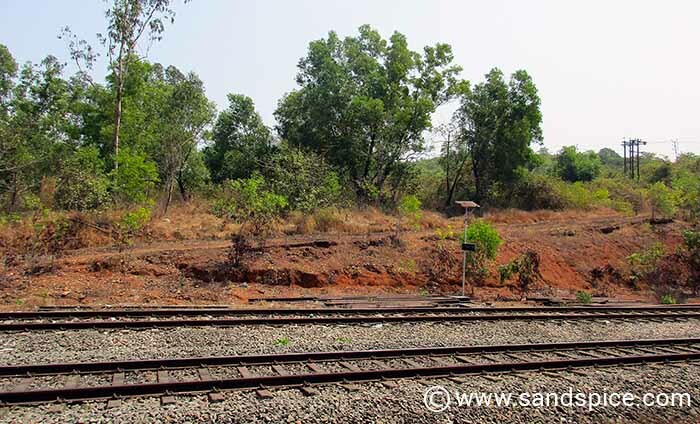 We knew that Canacona train station wasn’t too far from the main South Goa beaches – maybe 3 or 4 kms. We took a short walk to the main road and found a bus stop. We waited there for 15 minutes or so, but then decided to start walking. It took us something over an hour to reach the backstreets of Palolem beach – luckily we had plenty of water with us. Along the way we were propositioned several times by opportunistic individuals offering accommodation at cheap rates. In particular, one young lady called “Rosie” stopped her scooter and insisted on showing us a room she had near the beach. We were walking in that direction anyway, and she made sure to stay close to us, keeping up the banter, and trying to put off the other hawkers. The room she eventually showed us was a dirty hut with a mattress on the floor. She was quite upset when we declined, complaining about all the motorbike petrol she had just “wasted”. After our walk from the station, all we wanted now was a sea breeze and a cool beer. We got both at the first beachfront bar we found at Palolem. Following all the hassles of the past 3 days, we finally had found somewhere to really relax. Next all we needed was some decent accommodation and a good shower. Did it years back, the reward is not the journey!